Taking notes and saving them is not just limited to text files or the usual notepad anymore. From students to professionals, almost everyone is well-acquainted with the Evernote software suite that allows them to set your priorities like, draft your schedule, write your ideas and easily track them. It helps you get organized and boost your productivity even in your super busy schedule and even while you are loaded with tasks. But, you must be wondering why you would choose an entire software suite over a notepad which you already have access to? That’s because, apart from just taking down notes and archiving them, it also allows you to share notes, collaborate with your team, save recipes and even sync your notes with several devices effortlessly. That’s not all, as Evernote enables you to enhance your mundane text notes with voice notes, transcribed notes, images and more. While Evernote has completely transformed the customary note taking process, can be downloaded completely free of cost, can be accessed on your smartphone and laptop, and boasts of a huge user base, there are many who are yet not comfortable with it. Among its downsides are its incompatibility with Linux-based devices, too many advanced features whereas many may rather prefer a simple alternative, requirement to download large files for its setup and moreover, the latest Work Chat feature is not properly executed, known for syncing problems, and few apps are bugged and lack flexibility. So, if you are simply looking for solutions that can provide you with close features if not the same for free or at least at a reasonable price, we have a list of some of the best alternatives to Evernote today that can just as well fulfill your needs. Check out the alternatives (both free and paid versions) below and let’s see what they have to offer..
Once popularly known as Microsoft Office One Note, One Note is now an independent note-taking software and is perhaps one of the best alternatives to Evernote that has come so close in terms of competition. This application is available to download for free on Mac and Windows PC OS and for mobile platforms such as iOS and Android. One Note provides a different experience in terms of its interface which offers a notebook with colorful appearance compared to the symbolic notebook by Evernote. Apart from the usual note-taking process along with the collection of links and photographs, you can insert parts of web pages; transform emails to notes and more. If you love to play around with the layout, it allows you to add music, check list or even use it as a travel planner. All said and done, One Note may not be the next Evernote, but with its ability to work with several devices and third-party apps like Zapier, Cheggy, etc., smooth assistance for taking a note and organizing, and compatibility with the Microsoft Office suite makes it a worthy alternative to the quintessential Evernote. Compatibility – Mac, Windows, iPhone, iPad, Windows Phone, Android, Web and Amazon. How can Goggle be far behind when it’s about utility apps? 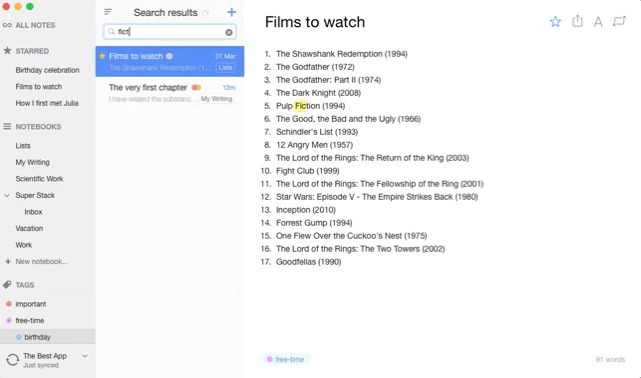 Google Keep is one of such offerings by the search engine giant that gives you an appearance that’s more like a virtual office. The layout allows you to post sticky notes those are interactive and offers a dashboard with a minimal approach. The interface is extremely and simple user-friendly compared to Evernote and hence, requires a minimum learning curve. You can easily keep a track of your projects using the basic grid view. Apart from adding notes, photographs, audio and lists you can also add color codes to your notes, share them with others and even set reminders. The reminders can be interpreted by Google Now or OCR to capture text from photos, voice notes that are automatically handwritten, etc. and moreover you can view the Google Keep notes via Android Wear. However, what we love about this software is the fact that it integrates seamlessly with the other services offered by Google, such as, Google Drive to save your notes thereby, offering more space unlike other applications, and offers Google Chrome extension. While Google Keep is a free app by Google that is handy for all those who rather prefer simplicity, it is currently available only for Android platforms. Just as the name suggest, Simplenote provides you a straight and simple application to meet your note taking needs. It avoids any needless embellishments and rather offers an extremely easy to use interface that is easily understood and can be used by anyone. While you can compose only text notes with Simplenote, you can also sync your notes with multiple devices using third-party apps like nValt and Notational Velocity, share them with others, automatic data backup, and many such features. Additionally, you have the freedom to access your notes from anywhere, you get a lot of space to store your data, and also offers a search tool that helps you find any of your notes easily. Tag crucial notes to track them faster, pin notes or important tasks, undo any modifications made to your notes or lists and more with Simplenote. Although it may look a totally fundamental application at the first look, Simplenote comes with features concealed below every note viz. sending options for notes, browse history, track word count, etc. However, you cannot add a photo, make a check list or even format text, but only write and save plan and simple notes and a bit more. It is absolutely free to download and works with different ad-supported platforms like, iOS, Android and Mac. There are not many alternatives to Evernote that are available free of cost and one of them is ToodleDo that offers unique features for no charge. In contrast to other note-taking applications, ToodleDo prefers to keep notes and tasks isolated, rather deliberately. So when you sign into the web application you can notice both the functions listed under two separate tabs. While this layout may be interesting to some, but not many are comfortable using individual options. Although the interface may appear a bit weird to many compared to the simple approach by OneNote, Google Keep, Evernote or the Simple Note, it does a lot more than just adding notes and tasks. ToodleDo is considered handy compared to the Evernote, as it supports stratified lists or summaries, offers a complete section that helps you to build good habits and avoid bad habits, provides tools to arrange notes and tasks, and similar other features. 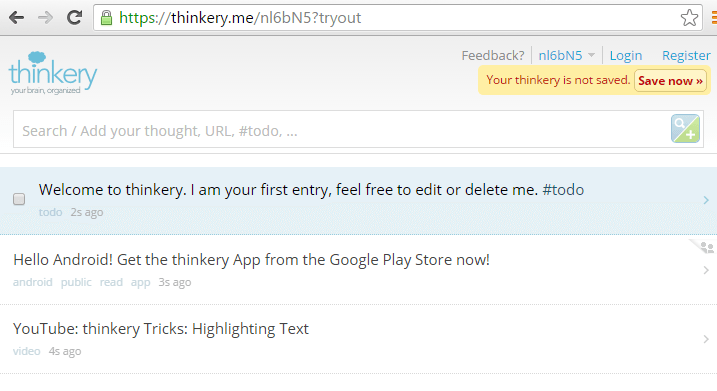 Thinkery offers features and objectives that are strikingly similar to Evernote. However, it’s a web application is extremely intuitive that makes it a little user-friendly than Evernote’s awkwardly designed web app. You can tag all notes using hashtags, and also search all the saved notes. Moreover, you can also make your notes public or private based on your preference, just that its collaboration options does not match the standards of Evernote. What’s best about Thinkery is its ability to pick up suitable information from a website and project it in an attractive manner. So, Thinkery will automatically pick up information from a link on Amazon for example that you must have bookmarked and display the item price and details and that can be searched instantly. It also offers a relatively stronger ability to capture parts of web pages that is either available as a chrome extension or as a bookmarklet application. 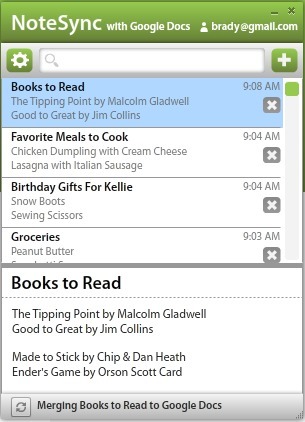 This helps you to bring in bookmarks, data or save links from your Evernote app. Thinkery is free to download on platforms like, iOS, Android and web, and is a great alternative to Evernote gaining fast popularity with uniform features. 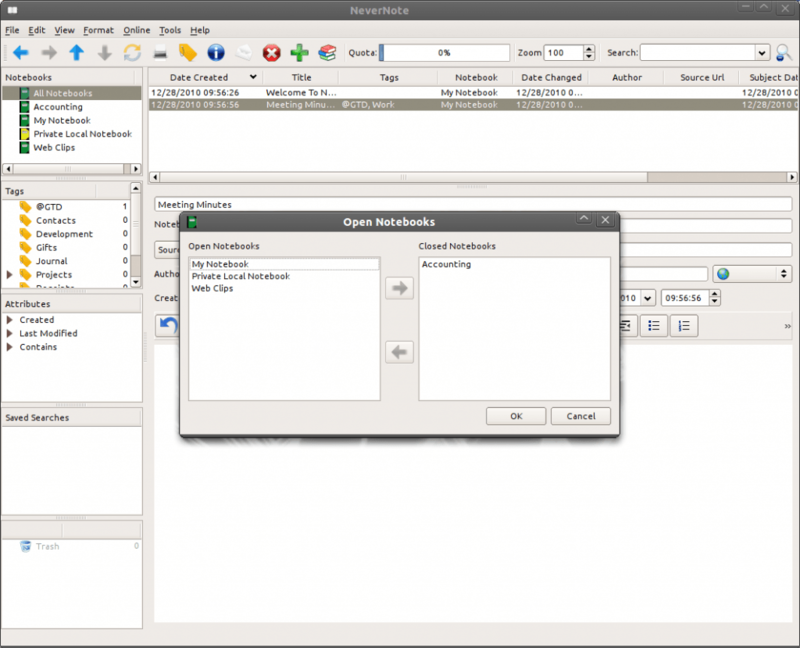 Nevernote is an open source Evernote clone as it says, which primarily aims to service Linux clients. However, it also runs on Windows and Mac OS. Even though it is claimed to be a clone of Evernote, it is nowhere related to or backed by Evernote. It offers some great features which is a perfect choice for those who prefer open source applications. If you are already an Evernote Linux client, you will be able to log in using the same credentials that you use for your Evernote account and then you get access to some of the fantastic features by Nevernote viz., notes that are color coded, ability to share notes and more. There are no issues reported so far for those who have been using it for both 32 bit and 64 bit architectures of Linux in addition to Sun’s Java and OpenJDK. Nevernote is a free web application that enables you to take notes and save them just like you would do with Evernote, but on Linux as well. Wondering how Google Docs can help you with note-taking? Well, Google Docs enable you take notes and save them in Google Drive in order for you to access them from any part of the web. It not only allows you to write and store text notes but also provides additional features like, preparing presentations, create spreadsheets and many others. Oh! Wait! Google Docs also lets you collaborate with your colleagues real-time. Now, isn’t that great? What better than an online leader like Google to be an alternative for Evernote? The best part is Google Docs is an app available free of cost and is beneficial for all from students to experts. Take notes, insert tables, use the research pane, insert by snapshot or insert drawing and perk up your notes instantly. If you are looking for something utter simple that allows you to take notes and save them to be used later, NoteSync is one of the best alternatives for Evernote. 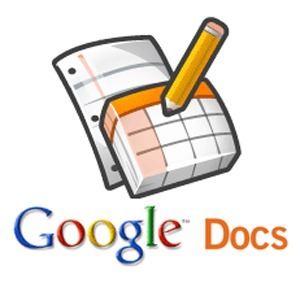 This application is developed to specially make notes fast along with the syncing capability with Google Docs. As the name suggests, all the notes that you take automatically synchronize with the Google Docs every minute. However, you can also choose to sync notes manually if required. Till the time you are online, all your notes will be accessible on all compatible devices. Moreover, the fact that Notesync keeps your data protected using the safe HTTPS protocol is one of its top benefits. This will ensure that your data is safe from the hands of any hacker. Not just that, it is also a great choice when you want to take notes for your work. It is an extremely simple and user-friendly software that comes with an engaging interface. Notesync helps you to find your saved notes through its search function, offers shortcuts available to use for repeated tasks and more. The only setback for this application is its non-availability for other chief platforms, however, it is still an excellent alternative to Evernote considering its ease of use, security and effectiveness. Notesync is available to download for free for Mac and desktops, but for the Android platform there is a $0.99 fee. 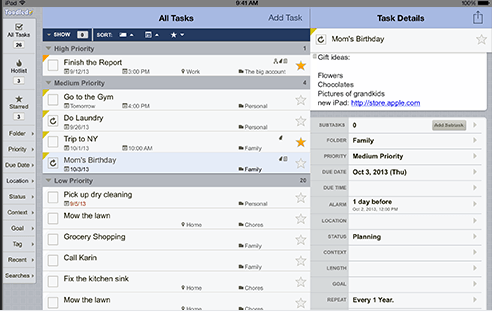 DEVONthink is more of a digital assistant that can manage your documents, bookmarks and notes effortlessly. While it is available in different paid versions such as, DEVONthink Pro, DEVONthink Personal, DEVONthink Pro Office and DEVONhink To Go, it is also available as a freeware that offers some really good features to try out. 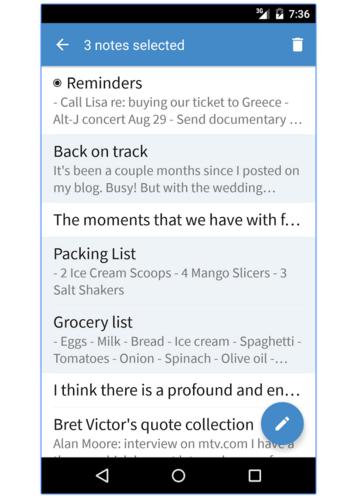 Among the many features of DEVONthink Personal are its ability to write text, add photos, offers AI based actions, help you with advanced and more. That’s not all as it also allows to sync your data with different devices helping you to import notes and documents on your Mac. However, do ensure that you select the internet or local network to carry out the synchronization. While it is also available as a freeware that offers limited features, the pro versions of DEVONthink offers some of the best professional functionalities that are superior compared to the Evernote. However, the only aspect where it loses in front of Evernote is its limitation of compatibility. If you want an app that sheds the ecosystem look of the Mac Evernote which is quite unmanageable and too green, Alternote is just the right solution for you. So how does the sync of Alternote work? Well, it uses your Evernote login credentials to synchronize your notes which make the entire process pretty easy. Moreover, it offers many features which are similar to Evernote like, searching notes or docs by tags or rich-text formatting. That’s not all, as Alternote offers a really cool feature which activates a distraction free mode if you want to type on a blank screen. In this mode, it reduces the screen brightness slightly while you write which though may not be a significant feature, but is indeed a smart one. That apart, Alternote offers an extremely polished user experience that more focuses on taking notes and overall competes with the Mac Evernote features. With such an elegant interface to offer that concentrates on your note-taking experience costs only $6.99. However, for those who still want some time to decide, Alternote comes with a three-day trial period where you can directly download the app from their website and then take a call. The only limitation here is its compatibility options which is restricted only to Mac OS X for the moment.